Trying times are ahead for Alice Harrington and her cousin, Fred Allerton. First their cousin, Addy, develops a cough that won't go away. Fred's father, a doctor is worried that Addy might have tuberculosis. She may need to move to a sanitorium and could even die. Then the stock market crashes on what people call 'Black Tuesday.' Alice and Fred don't understand the fuss, but it's obvious their parents are worried. People are losing their jobs. What can Alice and Fred do to help Addy and their friends? And will the financial problems make them homeless, too? - Publisher In the "American Adventure" series, young readers find children very much like themselves who view American history firsthand, and experience how it felt to live during those times. Compelling illustrations accompanying each story. 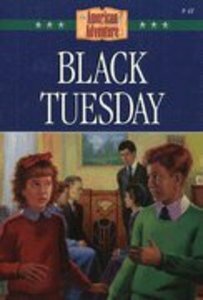 About "Black Tuesday (#41 in American Adventure Series)"
In the "American Adventure" series, young readers find children very much like themselves who view American history firsthand, and experience how it felt to live during those times. Compelling illustrations accompanying each story.